Diffuse Idiopathic Skeletal Hyperostosis (DISH) refers to a non-inflammatory disease that is characterized by ossification/calcification of soft tissues, entheses, and spinal ligaments. DISH primarily affects the Anterior Longitudinal Ligament (ALL) at the attachment sites to bone in the vertebral column. DISH is a complex disorder that not only affects the musculoskeletal system, but also can cause additional gastrointestinal, respiratory, cardiovascular, and neurological impairments due to bone compression of adjacent structures. The reported prevalence of diffuse idiopathic skeletal hyperostosis is widely varied throughout the course of available research. One of the main reasons for this variability is the different locations of structural manifestations in the vertebral column. The recent evidence of DISH reports prevalence of the disease is increased in with increasing age more prominently found in the 60s and 70s. 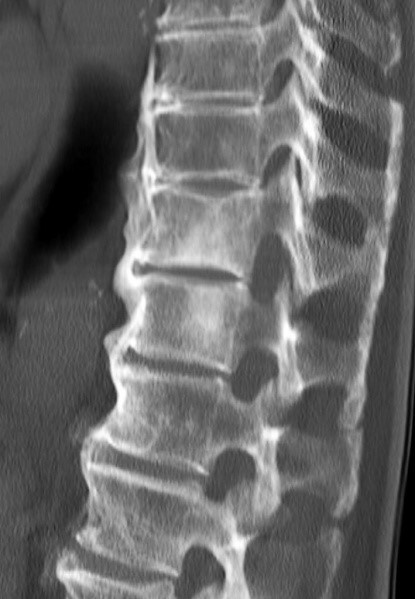 DISH is found to affect the axial skeleton with the thoracic spine (T7-T11), being the most common levels affected. Other structures commonly affected include: pelvis, patella, calcaneus, and the olecranon. It has also been discussed throughout the research that a genetic component has a possible place in the role of development and diagnosis of the disease. DISH has been shown to have a multiple associations with a number of conditions and dysfunctions. One of the most prevalent associations according to recent research is to metabolic syndromes. The following conditions are shown to be commonly associated with the diagnosis of DISH across the spectrum of individuals affected. Cardiovascular conditions including, but not limited to hypertension, atrial fibrillation, left ventricular hypertrophy, peripheral arterial disease, and cardiovascular disease. Neurological impairments, while typically uncommon with the presentation of this disease, can manifest in the form of spinal cord compression, muscle weakness, numbness and tingling, and sesory loss. Current research does not outline a specific and definitive schedule of medications used to treat DISH. The following medications have been used as a method of control and/or manage the symptoms of the disease process. 1. Anterolateral ossifications of at least 4 contiguous thoracic segments. 2. Preservation of intervertebral disc spaces. 3. Absence of apophyseal joint degeneration or SI inflammatory changes. A formal diagnosis of DISH does not require or mandate the presence of constitutional and metabolic abnormalities; however, it is known through numerous studies that systemic conditions are associated with DISH in varying degrees. Enthesopathies, which is a disorder involving attachment of tendon or ligament to bone at the entheses, are commonly seen in the iliac crest, ischial tuberosity, and greater trochanters. Spur formation in appendicular skeleton seen at the olecranon process, patellar ligament, and calcaneus. The current research on DISH lacks a definitive cause of the disease. A number of theories have been postulated that relate abnormal growth and function of osteoblasts in the osteoligamentous binding centers that; however, this is not a widely accepted theory among the current research. There are certain factors that have come to be associated with DISH and are thought to have some relation to the pathophysiology behind the disease process. Due to the high association of metabolic syndromes with the diagnosis of DISH, it is common to see systemic involvement in individuals who have this condition. A majority of metabolic syndromes associated with DISH have a link to obesity and a sedentary lifestyle which can in turn be a cause of diabetes, hyperlipidemia, and hypertension. The following conditions are associated with a diagnosis of DISH. Juvenile Idiopathic Arthritis (JIA) should be considered if suspected in children. 2. Zhang C, Ruan D, He Q, Wen T, Yang P. Progressive dysphagia and neck pain due to diffuse idiopathic skeletal hyperostosis of the cervical spine: a case report and literature review. CIA. 2014;:553. 4. Murayama K, Inoue S, Tachibana T, Maruo K, Arizumi F, Tsuji S et al. Ossified Posterior Longitudinal Ligament With Massive Ossification of the Anterior Longitudinal Ligament Causing Dysphagia in a Diffuse Idiopathic Skeletal Hyperostosis Patient. Medicine. 2015;94(32):e1295. 5. Hasegawa K, Takahashi H, Iida Y, Yokoyama Y, Fukutake K, Takamatsu R et al. Spontaneous Symptomatic Pseudoarthrosis at the L2-L3 Intervertebral Space with Diffuse Idiopathic Skeletal Hyperostosis: A Case Report. Case Reports in Orthopedics. 2013;2013:1-4. ↑ 3.00 3.01 3.02 3.03 3.04 3.05 3.06 3.07 3.08 3.09 3.10 3.11 3.12 3.13 3.14 3.15 3.16 3.17 3.18 Mader R, Sarzi-Puttini P, Atzeni F, Olivieri I, Pappone N, Verlaan J et al. Extraspinal manifestations of diffuse idiopathic skeletal hyperostosis. Rheumatology. 2009;48(12):1478-1481. ↑ 5.00 5.01 5.02 5.03 5.04 5.05 5.06 5.07 5.08 5.09 5.10 5.11 5.12 5.13 5.14 5.15 5.16 5.17 5.18 5.19 5.20 5.21 5.22 5.23 5.24 5.25 Nascimento F, Neto H, Gatto L, Lages R, Demartini Z, Koppe G. Diffuse idiopathic skeletal hyperostosis: A review. Surgical Neurology International. 2014;5(4):122. ↑ 6.00 6.01 6.02 6.03 6.04 6.05 6.06 6.07 6.08 6.09 6.10 6.11 6.12 6.13 6.14 6.15 6.16 6.17 6.18 6.19 6.20 6.21 Mader R, Verlaan J, Buskila D. Diffuse idiopathic skeletal hyperostosis: clinical features and pathogenic mechanisms. Nat Rev Rheumatol. 2013;9(12):741-750. ↑ 7.00 7.01 7.02 7.03 7.04 7.05 7.06 7.07 7.08 7.09 7.10 7.11 7.12 7.13 7.14 7.15 7.16 7.17 7.18 7.19 7.20 7.21 7.22 7.23 7.24 7.25 7.26 7.27 Bombak A. Diffuse Idiopathic Skeletal Hyperostosis and the Osteological Paradox. Totem: The University of Western Ontario Journal of Anthropology. 2012;20(1):1-19.